Bobby Clampett, shown in 2000, has turned his attention to helping other golfers by teaching the importance of impact. View videos of Bobby Clampett explaining his impact zone theory. If only Bobby Clampett knew 30 years ago what he knows now. Perhaps his obsessive search for the "perfect" golf swing wouldn't have led him from one teacher to another and sidetracked his career. Perhaps the two-time collegiate player of the year at Brigham Young University would have lived up to his enormous potential. It's too late for the 52-year-old Clampett, who won one PGA Tour event and now splits his time between the Champions Tour, where he has had moderate success, and his job as a golf analyst for CBS Sports. But it's not too late for the millions of golfers he wants to help. Clampett says most instruction fails to help golfers improve because teachers focus on things such as body positions and swing plane instead of the only thing that matters: the impact zone. "With impact-based teaching, impact is the starting point and end point of all teaching," he said. "It is the common denominator of all the best players in the game. It's the moment of truth. It's where the rubber meets the road. "And yet today in traditional teaching, 99.9% of the time impact is never discussed. The student is not educated about it. And thus the golfer does not improve because whatever the teacher is telling them about their swing style doesn't improve their impact." Clampett recently launched Impact Zone Golf (impactzonegolf.com), a teaching system based on his groundbreaking 2007 book "The Impact Zone." More than 100 instructors have become certified impact zone teachers and a four-DVD set, "The Impact Zone Training System," shows golfers the secrets of better impact. And it has nothing to do with what the swing looks like. "We're teaching things to look good but not be effective," Clampett said of golf instruction in general. "Yet we've got a guy, Josh Broadaway, who is playing the tour cross-handed. And he's a brilliant ball-striker. "Look at Tommy 'Two Gloves' (Gainey). What a golf swing there. Look at Bubba Watson. What kind of golf swing is that? Masters champion. You look at Rickie Fowler and go, 'Really?' And it goes on and on. The old days. (Lee) Trevino. Come on. Who's teaching that golf swing? "They say plane is what matters. Then you look at Larry Nelson, who won major championships, and he's across the plane. And you look at Tiger (Woods) and he won the '97 Masters with a shut club face across the plane but he also won British Opens with an open club face and laid off. So is that the answer? No." Clampett said he did a comprehensive study that showed a direct correlation between the bottom of a golfer's swing arc and his or her handicap. The better the golfer, the farther forward the divot. "All the best players in the game, their swing bottom is four inches in front of the ball," he said. "You can hear the strike, the compression, the club against the ground. When I play with (amateurs), I hear them hit the ground all the time before the ball. Or they hit the top of the ball. Those are the only two things that happen when your swing bottom isn't where it's supposed to be." Clampett said any golfer can make rapid improvement by learning and using the drills he teaches in Impact Zone Training. He's seen it first-hand time and again. "I may not turn you into Tiger Woods, but I'm going to improve your game by improving your impact," he said. "We're having thousands of testimonials by people who are improving their games dramatically. Handicaps that are cut in half in 15 minutes. These are the kind of results we're getting." He said he was motivated by a study by the National Golf Foundation that found people who quit playing golf listed a failure to improve as one of the main reasons. "Last year we lost half a million golfers from the game," Clampett said. "And in the top three reasons why we're losing golfers is people take lessons and don't get any better. It's tragic. It's killing our game. 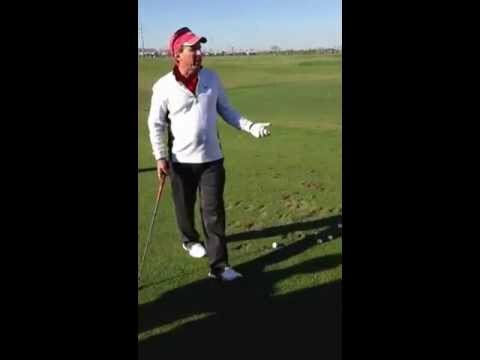 "My big fault was listening to swing style teachers try to change my swing style. If I knew this back then it would have been a different story. But that's part of the journey and it's part of what led me to create this to help the game. "I feel it's my duty to do what we're doing. I feel it's a cause and that if I don't do this I'm going to feel an emptiness the rest of my life. Because I know this is going to help the game."